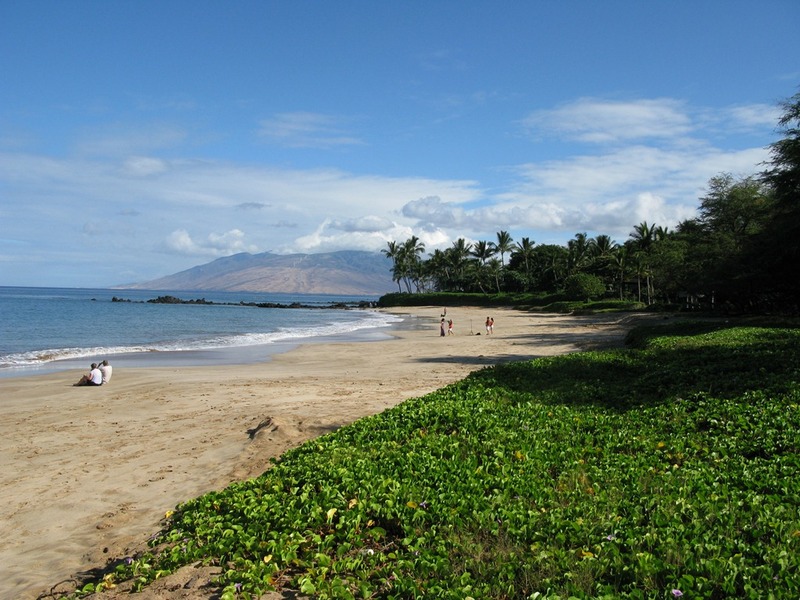 Today, Brenda looked up more beaches in the Maui Revealed book, trying to find something a little less busy than Ulua Beach. 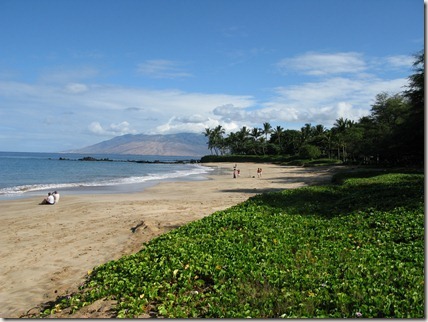 She found one called Palauea Beach in Wailea that was highly recommended. Granted it was earlier than our Tuesday excursion to Ulua, but check out this beach, which we had almost completely to ourselves. To the south there was amazing snorkeling just off the shore in the rocks. Several diving and snorkeling boats stopped by to let people dive in this location while we were here. 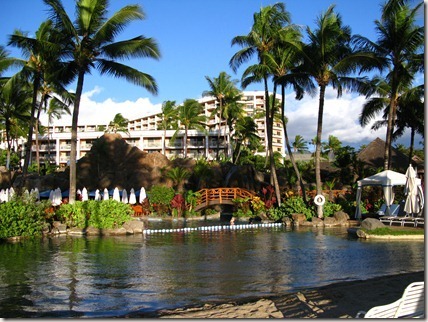 Brenda and I took turns snorkeling. When I went out, I finally started to feel comfortable with the snorkel, mask, and fins. 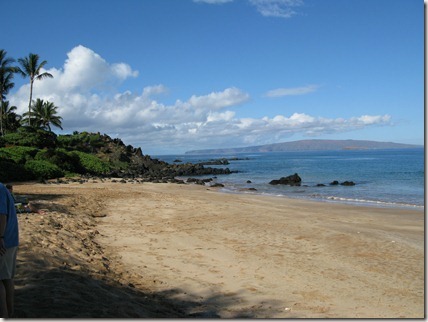 I swam out a little over the rocks in about 15 or 20 feet of water, looking at the coral and fish -- all painted in bright colors. As I continued swimming, I turned and saw a giant sea turtle cruising right at me, trailed by two other snorkelers (holding hands). The snorkelers turned and swam toward the shore, and I continued swimming with the turtle for a few minutes, watching him come up for air and then diving back down. I'd seen sea turtles in shallow water in Hawaii, as well as on beaches; but seeing their grace and speed in deeper water was a totally different experience. There's something startling about seeing a giant turtle coming at you underwater, and you can almost feel the primal part of your brain kicking in to assess whether you're in any danger. Brenda also said she had this reaction after seeing a giant turtle at Black Rock. 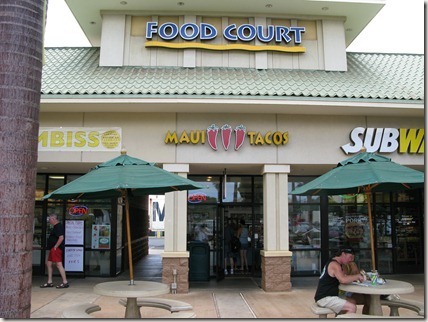 After snorkeling for the morning, we drove in our damp and sandy swimming suits straight to a food court in Kihei. 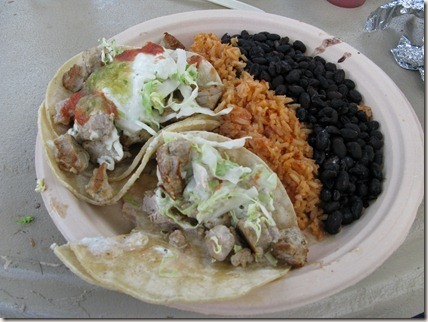 We'd been reading about Maui Tacos and wanted to give them a try. Pineapple Paradise (medium) - This was a green salsa with pineapple, tomatillos, sweet onion, garlic, cilantro, jalapenos and lime juice. This was my favorite. 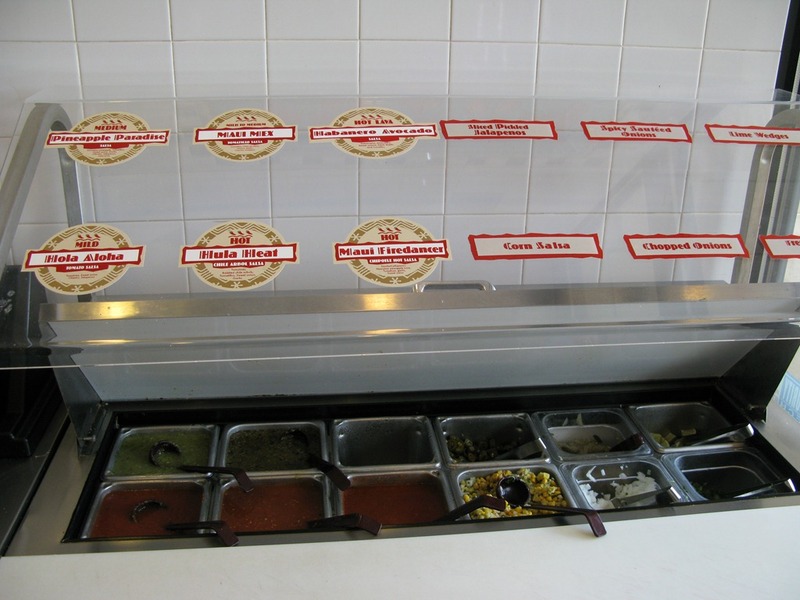 Maui Mex (medium to mild) - Another green "tomatillo" salsa that also had Chile de Arbol (Spanish for "tree chili"), onions, garlic, oregano, and cilantro. Another one of my favorites. Habanero Avocado ("hot lava") - Included habaneros and avocados. I stayed away from this one, so I don't have a review. Hola Aloha (mild) - A red salsa with jalapenos that's similar to what you find in Mexican restaurants in the States. Also very good. 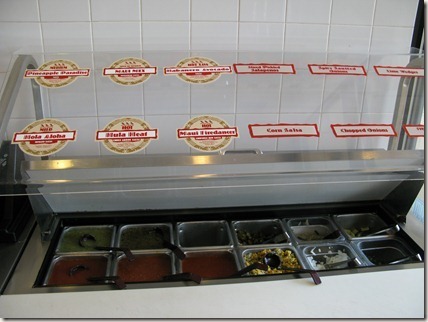 Hula Heat (hot) - This is a red salsa cousin of Maui Mex. I didn't try this one. Maui Firedancer (hot) - Another red salsa that includes the smoky and sweet combination of chipotle peppers and pineapple juice. 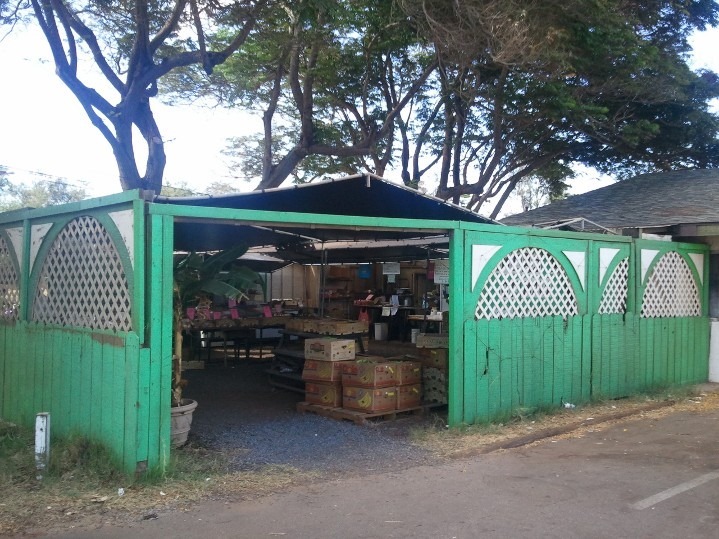 Later in the day, Brenda wanted to go to the Farmer's Market near the ABC store in Kihei, so we drove over there right before it closed. The boys wanted to try coconut milk, as well as sugar cane. 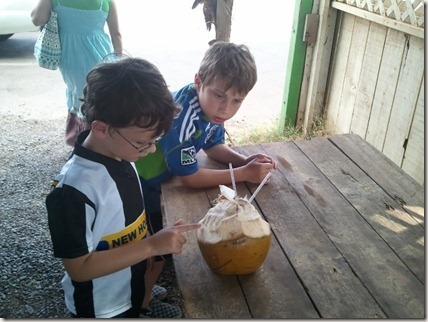 I know it was about 20 minutes to closing time, but I was surprised at how irritated the woman was who helped prepare the coconut and sugar cane. Maybe she knew that the boys wouldn't like any of it (which they didn't). 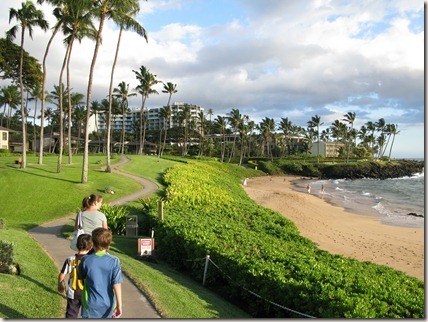 For our last activity of the day, we drove back to Wailea to walk along the beach path between all the resorts. 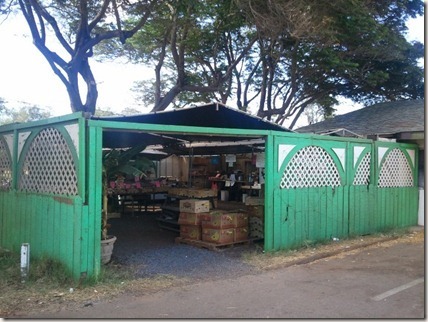 To do this walk, you park in the Ulua Beach parking lot (now mostly empty) and then find the trail. 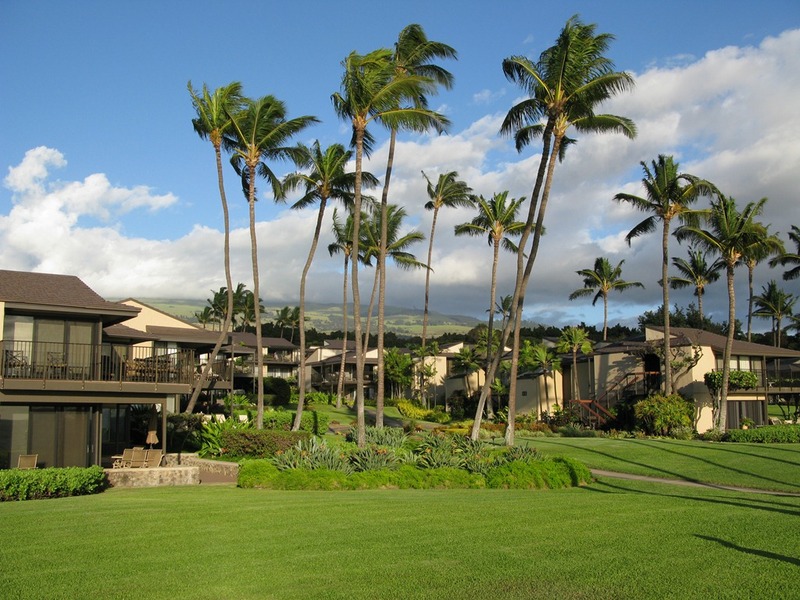 Walking along the trail between all the resorts, you see the Hawaii that most people probably envision: luxurious buildings nestled into perfectly manicured grounds that offer a front-row view of the ocean. The last resort we visited, the Grand Wailea, had a summer camp for kids. 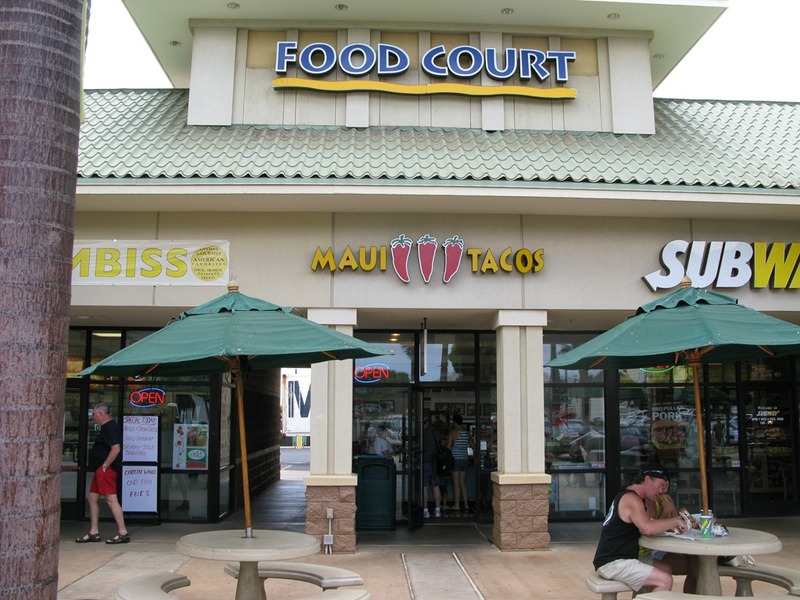 Brenda thought that showing the kids the extensive waterpark would get them excited so we could go out to at least one meal without them. It definitely did the trick, as Cameron said, "This is torture. I want to go in!" after he saw all the waterslides and pools. 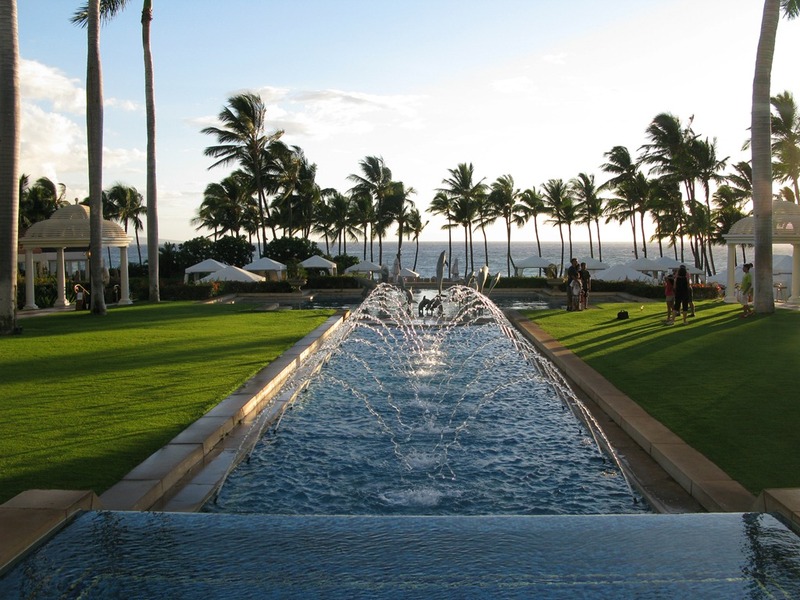 The Grand Wailea is owned by Waldorf Astoria, so it's not cheap to stay there. 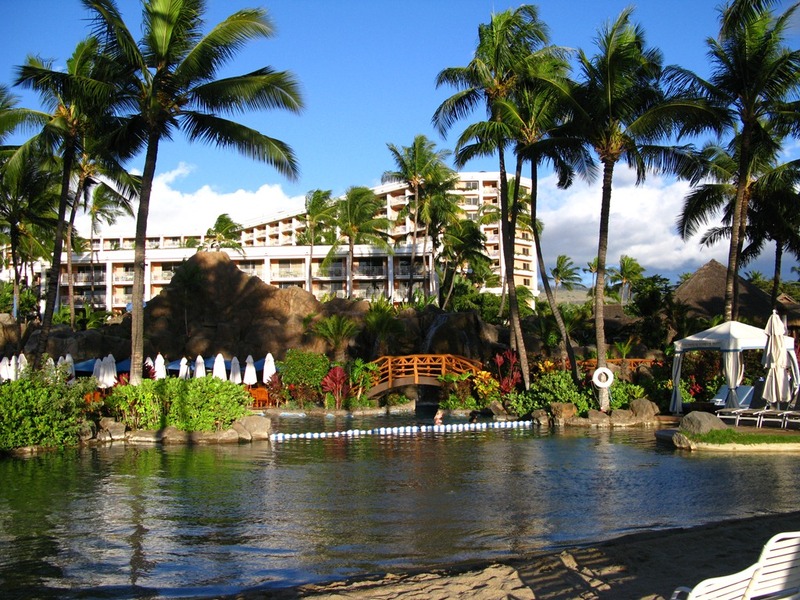 The rates (in 2011) start at $369/night and go up to $819/night for the Napua Club Room. 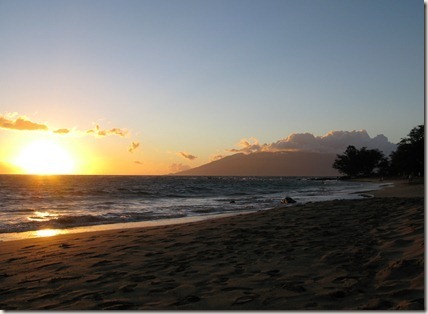 After walking the trail, we made it back to Ulua Beach to wait for sunset. 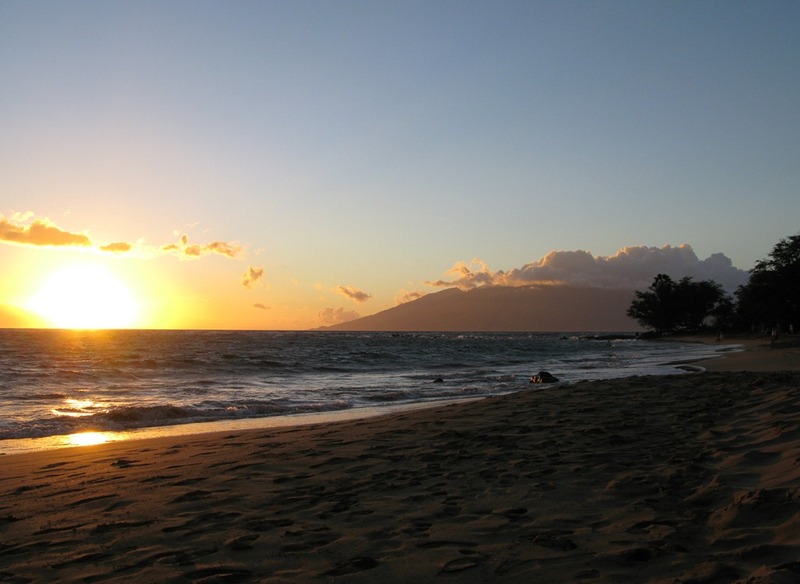 Sunsets are a big deal in Hawaii. First, they look amazing, but I think there's something more primal. We've forgotten about night in the way our ancestors experienced it. The night sky with its constellations was once a nightly show -- as well as a way to navigate the seas -- that brought order to the chaos of night. Now, in our lighted modern cities, the the darkness of night has has lost its meaning, the stars faded due to light pollution. In Hawaii, night is a real thing, where the stars still wheel brightly overhead, sometimes joined by the moon. And the blackness only ends when the sun rises.